CAUCASIAN WOMAN (talking to an African American Santa Claus): I’m not dreaming of a...white Christmas! Artist Unknown. 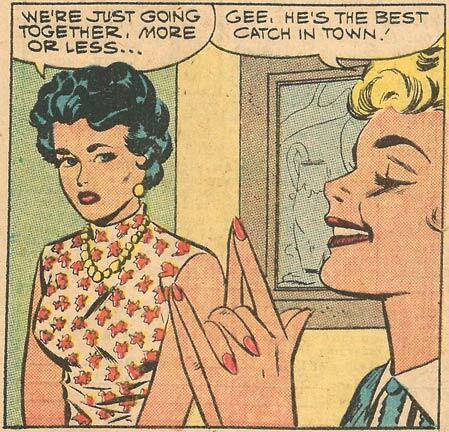 From the story "Bachelor's Farewell" in FIRST KISS #7, 1959. A Last Kiss on a Tuesday? Yup. 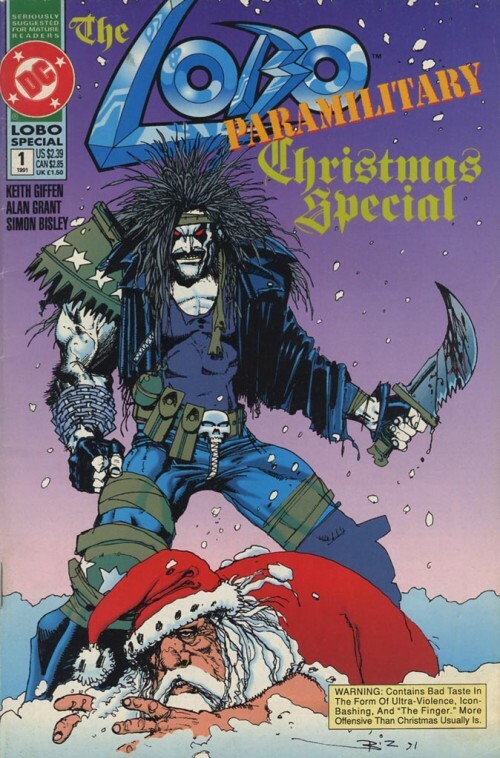 I’m celebrating the holidays by running new comics every day through Christmas. I hope you enjoy the extra kisses! 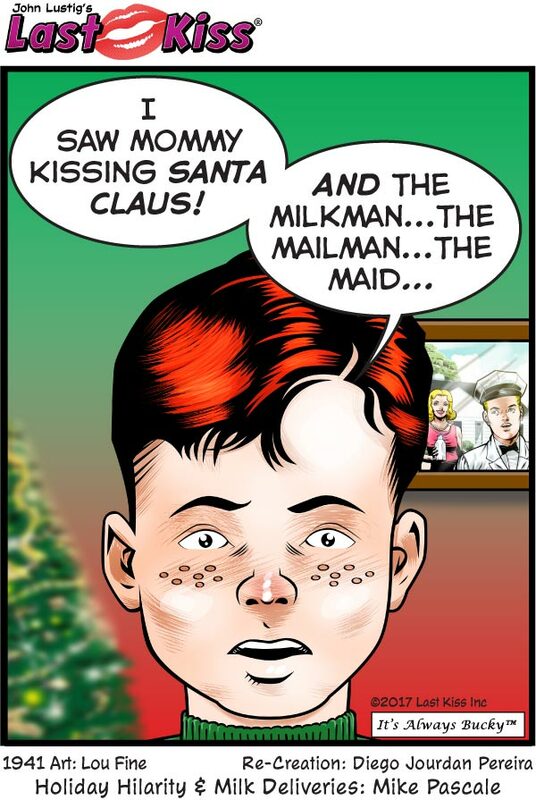 My thanks to Mirthful Mike Pascale for today’s gag and revamping Diego’s art to give it a Christmas theme! 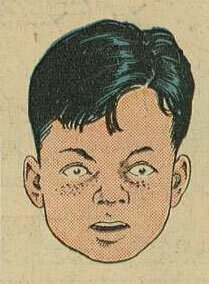 Art by Lou Fine from SMASH #26, 1941. Anyone can get on Santa’s Naughty or Nice List. 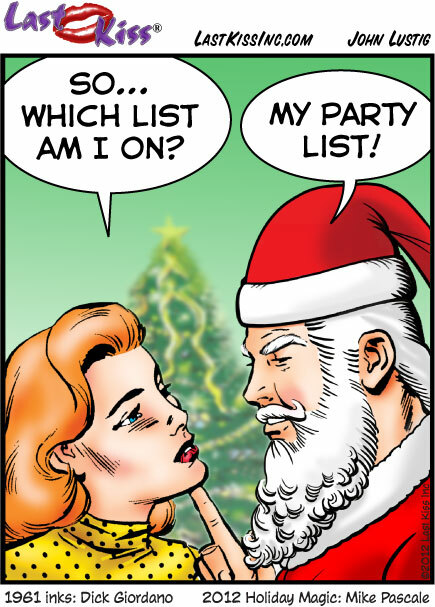 Santa’s Party List, however, is exclusive. Kim Kardashian, Nancy Grace, the Octomom, most politicians and all of your in-laws are just a few of the billions of people who DON’T make Santa’s Party List. Just remember to bring your own bottle (Santa prefers rum.) 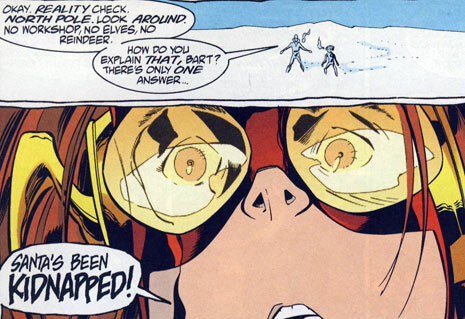 And watch out for the elves. They’ve been working for 364 straight days. So they’re horny and most of ’em are about as tall as your crotch. Think about it. Or, better yet—try not to. Happy holidays from me and magical Mike Pascale! Art as previously colored by Allen Freeman for another Last Kiss project. SCENE: Woman talking to Santa. WOMAN: So…which list am I on? SCENE: Woman talking to another woman. WOMAN: I’m good...as long as Santa doesn’t Google me!